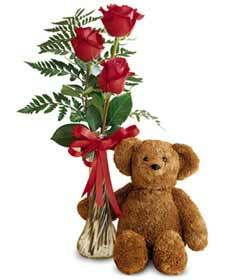 Datails: Three sweet roses arrive with a soft, plush bear. Bear size and color may vary. Roses available in red, yellow, pink, peach, and white. Attachments: We can add flowers... or even digital camera, DVD player ... to your order. Please, send us an inquiry via e-mail to deliver requested product(s) with your order. Our administrator will contact you shortly with payment details for your order processing.